Carmona, N.; Elorza, J.; Recasens, J.; Bragard, J. Composition of fuzzy operators often appears and it is natural to ask when the order of composition does not change the result. 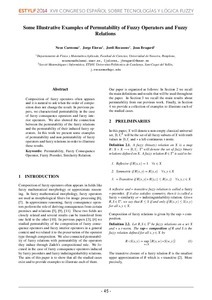 In previous papers, we characterized permutability in the case of fuzzy consequence operators and fuzzy interior operators. We also showed the connection between the permutability of the fuzzy relations and the permutability of their induced fuzzy operators. In this work we present some examples of permutability and non permutability of fuzzy operators and fuzzy relations in order to illustrate these results. Carmona, N. [et al.]. Some illustrative examples of permutability of fuzzy operators and fuzzy relations. A: Congreso Español sobre Tecnologías y Lógica Fuzzy. "XVII Congreso español sobre tecnologías y lógica fuzzy : libro de actas / [editores: Fernando Bobillo ... [et al.]]". Zaragoza: 2014, p. 45-49.